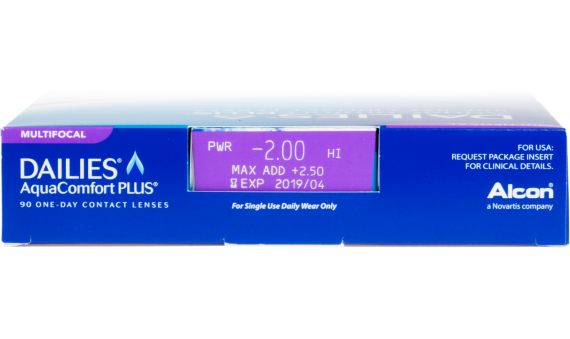 Package details: PACKAGE DETAILS:90 sterile, daily wear soft contact lenses, 31% nelfilcon A, 69% water, in buffered saline containing PEG and HPMC. The saline may contain up to 0.05% Poloxamer. Enjoy the freedom of DAILIES® AquaComfort Plus® Multifocal lenses. Different than bifocals or reading glasses, with these lenses you won't need to move your head up and down or look particular ways to see. 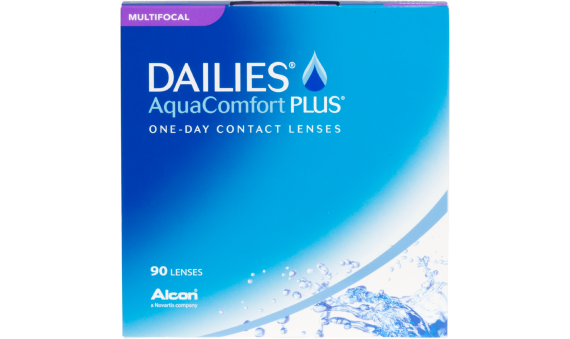 DAILIES® AquaComfort Plus® Multifocal lenses feature three moisturizing agents to provide superior comfort throughout the day.